Did you know that every new Innovative Language lesson is yours free? Fact: All new lessons are open to everyone for 3 weeks after the publish date. This is one of the major benefits of having a Free Lifetime Account at any one of our 31 Learning Programs. Just sit back and learn. High-quality audio and video lessons come out every week. 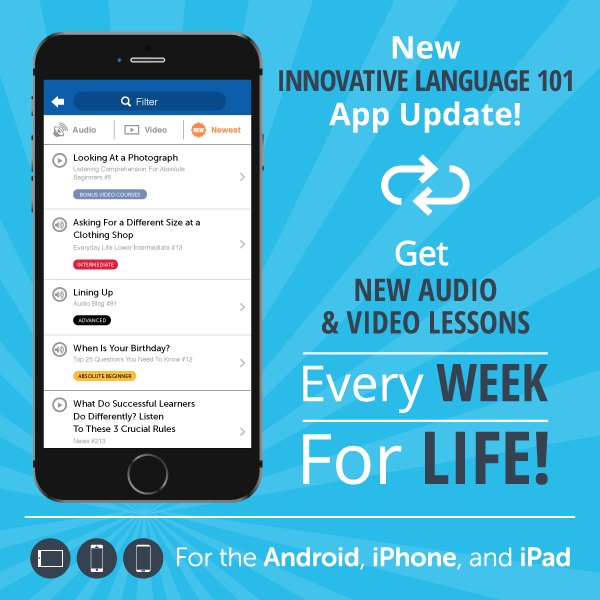 Click here to download Innovative Language 101 for the iPhone & iPad! When you log in to the App, simply tap on the “Newest Lessons” icon for all the latest and greatest lessons. Every time a lesson is published, you will find it here. High-quality audio and video lessons come out every week. Remember: Every new lesson is yours free. This a major benefit of the Free Lifetime Account. New lessons are open to everyone for 3 weeks after the publish date. High-quality audio and video lessons come out every week. P.S. Start Mastering a Language with New, Free Lessons Every Week! Want free lessons for life? Start speaking a language minutes into your first lesson. Choose any one of our 31 language programs and sign up for your Free Lifetime Account. You’ll instantly unlock real lessons by real teachers. Then, just sit back and learn at your own pace, anywhere, anytime. Click here to choose a language and sign up for a Free Lifetime Account!